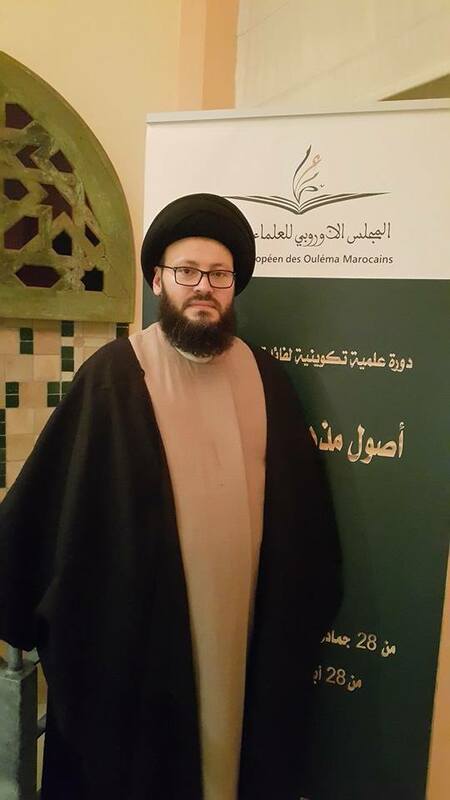 • الموضوع : Today’s Need for a Renewal of The Islamic Religious Discourse Cleric Mohamad Ali El Husseini speech. 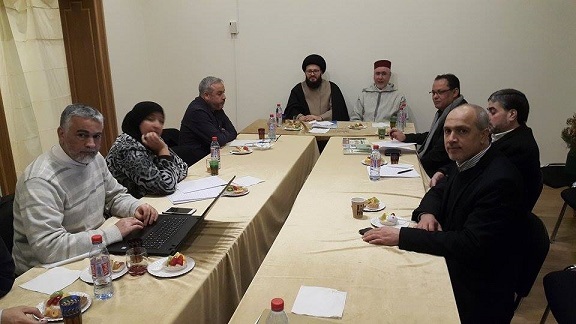 Secretary General of the Arab Islamic Council in the Scientific Forum (Brussels) of the European Council of Moroccan Scientists . We Thank you for this valued call, and we thank all those who helped and sought for this valuable session; and we ask that The Almighty God will have satisfaction and conduct it to us and to all the listeners and observers be reward and benefited, He listens and responds to prayers. The first reason: Internal; Islamism Muslim, which is the counterfeit suspicious awakening in the name of Islam, working for the objectives and agenda of a narrow and well-known goal and aims, which are more dangerous than external intervention, because they provide the ground to pounce on Islam, work to tarnish its image and give a bad impression about it. These ignorant deviant people from Islam distort the teachings of the sky are becoming a representative symbol of Islam. The most important point is that when doing their brutal bloody terrorist jobs they twist ahead God’s versus in the Holly Koran, the Messenger (S) sayings and the sayings of scholars and scientists for the purposes of the revelations, in order to mislead the public that these terrorist atrocities are sourced out from the Islamic religious discourse!! Here is the great disaster and the vast misfortune, as a result Islamic religion is now: real Islam and the distorted Islam, humane Islam and brutal one, open-minded moderate Islam that calls for tolerance and co-existence and closed extremist Islam that calls for coercion and atonement of the other. We, as Muslims, are today because of their awakening and move, we are in front of two completely different Islam. The second reason: external, as the enemies of our Islamic Nation, Fishers in troubled waters, are well aware that these terrorist groups and organizations and their acts as a shareholding company that exploits in the name of Islam to promote the religious-speech based on incitement to sedition, hatred, punishment, coercion and pushing others’ selves towards barbaric murders; they use the slaughter language to gain, from these of terrorism and blood trafficking acts, goals passed by a local, regional and international intelligence bodies; thereby seeking to implement electoral projects and political agendas at times, other expansive goals, and also economic goals with known purposes and aims. Hence from here we know why their is massive spending on the distorted propaganda to the image of Islam and the teachings of the sky and humanitarian concepts, all are these days are directed in one chart there by showing the Muslim carrying a sword at times, weapons or explosives in another time, and portrayed as returnee from the cave carrying hatred towards humanity: kills, slaughter, burn, blow innocent and peaceful people based on the Islamic religious discourse. This is what they want us today. It has two meanings: the first Meaning is what comes out from the Nation references and scholars, so that the words and the position of those - prima facie - represents the religion based on what they stand for, and what they have explicitly achieved is calculated on religion, there is no problem in this sense of religious discourse, especially at the application level; however it had a negative impact on the nation through other thought and speech some characterized by -regretfully- religion, and religion is innocent of him and his forms, we do not want here is to get into more details, as wise men can understand from a reference; and on the other side we still have references and scholars with true religious speech which is proper, open, and calls for the true principles of Islam, and preaches the Islamic call published in the best manner and without violence and without incitement not atone and this is our situation and our way. The second meaning of religious discourse, which is the legitimate governor is represented by the Holy Quran and Prophet Sayings (P), we can say that this sense of religious discourse is the original, the foundation, and the source, which clerics draws their media from. - Prevention of Corruption: The Almighty says: And cause not corruption upon the earth after its reformation. And invoke Him in fear and aspiration. Indeed, the mercy of Allah is near to the doers of good. - Leave the tongue of violence: The Almighty says: And do not insult those they invoke other than Allah, lest they insult Allah in enmity without knowledge. To other religious discourse of here in the Holy Quran and its verses inciting the court and calling for non-violence, peace and forgiveness, tolerance and dialogue in the best manner. The result is that the Holly Koran - which is the first corner in the religious speech- denies violence, coercion and expiation of the other; and urges and incites on tolerance, peace and non-violence. As for Prophet Mohammad speeches and biography, they are attested by the distant before the close ones, and by the enemy before the friend, that the Noble Prophet Muhammad (p) is the prophet of ethics and high morals, peace, love and kindness, and compassion, he is a role our model, the inspiring and calling for tolerance and love, and the constant instigator of nonviolence. If we listed Prophet Mohammad speeches and his great biography, we find that our Noble Prophet (p), like all the prophets of God, his biography assures his saying (p), in fact it is a witness of his morals and his urge to renounce violence and work on the principle of tolerance, forgiveness, pardon and mercy; and the best witness and evidence of that is when the Prophet (p) was at the height of victory inside Mecca, and all those who unjustified him, hurt, beat, and fought, were at his mercy and his ability, and he had the right of cropping them; however he did not kill them and took revenge of them because the Mohammedia mercy, forgiveness, compassion, and the principle of non-violence refused to practice any violence even on such people; where he chanted his immortal call (p) to them : Go you are free, and his saying (p): Spread peace among you. Thus came God’s Messenger Muhammad (p), with mercy and humanity, not to kill and slaughter as promoted by these ignorant people. 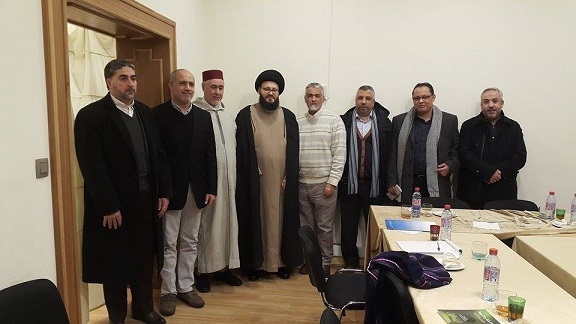 This is true of the Islamic religious discourse urges and emphasizes on the principle of mercy and peace, tolerance and non-violence, and at the same time rejects coercion, murder and blasphemy and violent practices and methods. This is the true and righteous Islamic view. There is an urgent need today is for the renewal of Islamic religious discourse by the people of the jurisdiction of the references and scholars of the Islamic nation, and to come back from the current denatured series that created a lot of toxins ideas in the beliefs of the deviant group that took conspiring steps to misrepresent the religious discourse on the pulpit, and when some ignorant people started to conspire against Islam and give religious speeches «Adaption, misrepresentation and distortion», they only preaches in fueling and raising «thermometer» of rancor and hatred towards other parties, and focus on the murder and slaughter and bloodshed raising banner of Expiation. Islamic religious discourse today needs to be balanced, observed and exposed to criticism by his Jurists and wise men and clerics. In view of what has been said above, today we see that there is urgent need to re-examine the Islamic religious discourse, develop, purify and renovate it to meet the so-called falsely -Islam – that is described by extremism, sedition, hatred, discrimination, expiation, slaughter, murder and blood. And the way to starts, as it was said: each status has its own serves and article, here is his family scholars and jurisprudence. Scientists had always been a special status in Islam, Prophet Muhammad (p) described them as the inheritors of the prophets. The Holy Quran has bestowed upon them a clear flood of respect and reverence when he addressed Muslims in many verses (ask of those who possess the Message.) From this standpoint, the responsibility of this important segment is very sensitive towards the renewal of Islamic religious discourse, and require from the world put forward his views, ideas, perceptions and proposals to address the Muslim issues, in accordance with the Holy Book and the Sunnah, and fit with the aspirations and the hopes of the Islamic nation in all parts of the world. What is required of the nation's scientists is to lead a realistic awakening and non-politicized or for directed for an intended purposes, but working for boosting the religious issue, starting from showing its realistic factual essence: the centrist, moderate and tolerant, which eradicate and displace all other suspicious and ultra-deviant speeches, and directs in the nation to the path of advancement. There is no doubt that the main point to start this holy way is to hold the reins of opinions and views presented to the nation about the various issues and topics and timely issues, organize and confine them in councils, institutions or exhaustive bodies that will be an authoritative reference for Islamic Affairs, and the only reference of Islamic in each country, and at every Islamic community in any country like your esteemed; so that we can root out all ignorant deviants from Islam who distort religion and entered the world of the sensitive Fatwa, who are extremely dangerous without any appropriate civil qualify for it and without responsibility, they made a misrepresentation of the Islamic religious discourse that commensurate with malicious intentions, and their evil deeds.